The National Association of Professional Background Screeners (NAPBS) seal of approval is more than just an emblem every CRA should have on their website (if they don’t, you should look elsewhere). It represents our dedication to your peace of mind. It guarantees that year after year, you can rest assured that as we provide you with industry–leading screening and clinical experience solutions, we’re fully committed to delivering the highest level of industry compliance standards that significantly reduce your company’s risk and liability. Your Top Five NAPBS—Accreditation Questions, Answered. Q: Ok, you’re NAPBS accredited. What’s in it for me? A: With us in your corner, you’ll never gamble with liability. With pre–employment laws and regulations changing every day, you need to be sure your company is protected from costly litigation as you hire, onboard, and retain employees. Our accreditation affirms our dedication to helping you understand your liability as we safely, securely, and ethically store all personally identifiable information (PII) in compliance with all industry best–practices. Q: What is NAPBS, anyway? A: NAPBS is the “gold standard” association for background screeners. With a purpose to advance excellence in the screening profession by providing consumers with the highest level of protection, NAPBS is the exclusive “gold standard” association because of its Background Screening Agency Accreditation Program (BSAAP). The BSAAP is governed by a strict and thorough set of professional standards with a widely recognized seal of approval that brings national recognition to the select few CRAs that earn accreditation. Q: What did you have to do to get re–accredited? A: We earned our re–accreditation by passing a dedicated 10–month process of rigorous desk and onsite audits that demonstrated compliance with the highest BSCC accreditation standards. We first presented full transparency of our formally documented policies and procedures to an independent third–party auditor for a “desk audit”—a gather—and—review process taking roughly six months. The audit process itself spanned three to four months, and all 400+ of our employees onsite were individually responsible for proving to the Background Screening Credential Council (BSCC) that all of our processes uniformly and ethically adhere to all industry compliance standards in these key areas. 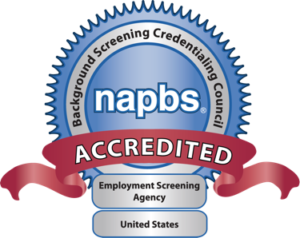 Q: Shouldn’t ALL screening companies be NAPBS–accredited? A: We think so! But surprisingly few are. Only around 5% of all CRAs nationwide are NAPBS–accredited, and only that select few can say we’re proven to consistently demonstrate safe, secure, and ethical practices, policies and procedures. If it were easy—everybody would do it. And food for thought: we’re the ONLY NAPBS–accredited CRA nationwide that specializes in both end–to–end clinical experience solutions and screening solutions. Q: Do you have to do anything to maintain the accreditation? A: Yes! Accreditation must be renewed every five years, reviewed mid–cycle, and upheld day–in and day–out. This is our second consecutive accreditation. To maintain the first one, we passed an Interim Surveillance Audit at the 3–year mark. To receive re–accreditation, we repeated and passed the full review process again, including both desk and onsite audits. And to maintain this level of excellence day–to–day, we dedicate countless hours—on a daily basis—to guaranteeing your peace of mind through our commitment to the NAPBS seal of approval. As we keep YOU up–to–date on the latest industry compliance standards, policies and procedures, our 400+ experts will keep on earning NAPBS accreditations, year after year. By choosing to partner with CastleBranch, you’ve chosen peace of mind in screening and clinical experience solutions. Feel free to reach out to our Help Desk at 888-723-4263 or visit the NAPBS website at https://www.napbs.com for more information. We’re 100% committed to your satisfaction before, during, and after you find the best person for your organization. Through compliance tracking, we’ll be there. As you hire, we’ll be there. During onboarding, orientation and beyond, we’ll be there. As champions of best practices, we thrive on decades of unparalleled resources and expertise that no one else in our industry can rival. We are hundreds of industry experts, all located—by design—at our single-location headquarters in North Carolina, each dedicated to bringing worry-free insights and efficiency to your talent supply chain. Discover our peace-of-mind promise today. © Castle Branch, Inc. All Rights Reserved.